The City of Chino Hills dates back long before its formal incorporation in 1991. Despite tremendous advancements throughout the years, the City of Chino Hills has maintained its rural heritage. With a population vastly approaching 80,000, Chino Hills has attained national recognition by being ranked #13 on the Morgan Quitno Press list of the top 25 "Safest Cities in the Nation" in 2008. It's central location makes it's commuters dream as it lies within the parameters of San Bernardino County, yet is a ten minute drive to Los Angeles County, Orange County and Riverside County . Nestled 40 miles from the City of Los Angeles, Chino Hills offers suburban living with easy access to the big city. Vellano Country Club is the newest luxury home community located at 2441 Vellano Club Drive, Chino Hills, CA. Vellano homes are luxurious homes with volumes of amenities. Three of Southern California's finest homebuilders are Master Builders for the community; Barratt American Homes, Brookfield Homes and Shea Homes. Vellano features homes rendered in styles that descend from Mediterranean design. These include Tuscan, Monterrey, Spanish Colonial, Italianate, Spanish Eclectic and European Cottage. The estate homes range from the low $1,000,000's to over $2,000,000. There are also several custom built homes. The tranquil gates of Vellano provide a sense of peace, serenity, and gracious, casual living. With the Greg Norman Signature golf course, the Clubhouse, the Swim and Athletic Club, several neighborhood parks and all the amenities that luxury living provides, Vellano is a premier luxury home community in Chino Hills. Vellano is what the homeowner with discriminating tastes desires. The Payne Ranch is located off Peyton Drive and Grand Avenue across from the United States Post Office. This small development of prestigious gated homes offers privacy and elegance with estates ranging from $1,300,000. A well established community with meticulous green foliage and lovely winding, picturesque streets, the Payne Ranch is quite appealing. The Beautiful Villa del Lago Gated Community is located near the intersections of Grand and Chino Hills Parkway. It is located conveniently close to the 60, 57, and 71 freeways. Within minutes from the newest The Shoppes, schools, parks, restaurants, and recreation areas. This community offers Chino Hills condo living that is quaint and yet has the feel of single family homes. Villa del Lago is not to be missed by anyone in the market for a prestigious condo development with its large community pool, picnic & barbeque area. 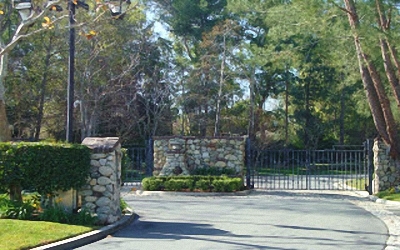 Come live behind the gates of Villa del Lago in Chino Hills CA! Promontory at Rolling Ridge is centrally located near the 60, 71 and 57 freeways. Located near Peyton and Beverly Glen South offers quaint condominium living on a cul-de sac. Located walking distance from Crossroads Marketplace where residents can enjoy Costco, Best Buy, Sport Chalet and more. Amenities include a community pool and spa. Chino Hills offers several great condominium complexes. Nestled close to the 57 and 60 freeways the Le Parc condominium complex is located in a suburban, well desired, community that sits adjacent to several area parks, schools and shopping within San Bernardino County. Due to its central location, commuting to any of the adjacent Counties of Orange, Riverside or Los Angeles is a breeze. It is within walking distance of several shops such as Best Buy, Lowe's and Costco. A quick trip down the street and you'll be in the midst of the newest upscale shopping center at The Shoppes. A quiet, serene community with a great community pool to cool off on warm summer days. Le Parc is a premier condominium community for first time buyers and those looking to downsize.